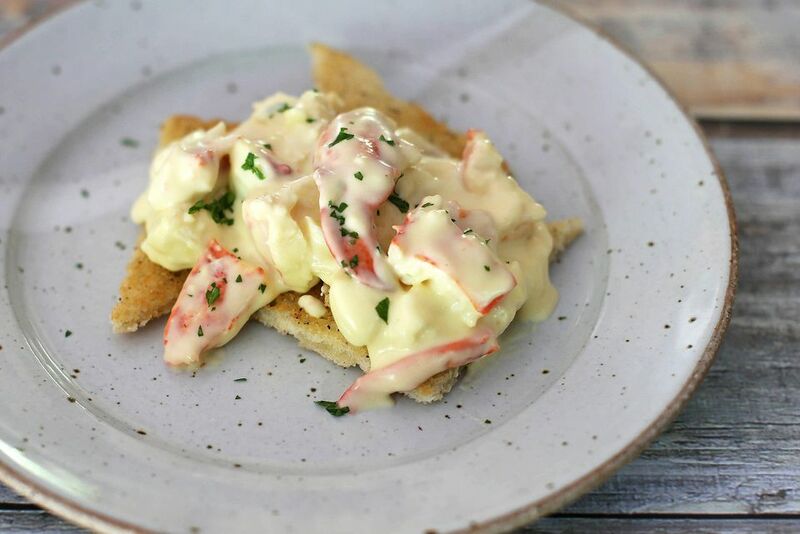 Use this recipe to make a tasty lobster Newburg. It incorporates eggs, flour, butter, sherry, and lobster into an unforgettable dish. You can serve the with its sauce on puff pastry shells or toast points for a very special seafood meal. Melt butter in a large skillet and blend in flour. Stir the mixture for about 2 minutes. Gradually stir in the half-and-half and stir the mixture until the sauce thickens. Stir in a small amount of the hot cream sauce mixture into the beaten egg yolks. Don't let them scramble, but just incorporate the ingredients. Then return that to the hot mixture. Continue cooking, stirring everything constantly for about 1 minute. Add the lobster, sherry, lemon juice, and salt. Continue to heat them in the mixture but do not boil it. Serve in hot puff pastry shells or over toast points. Lobster Newburg is a rich American seafood meal. Other variations can include cognac and Cayenne pepper, though they are not included in this recipe. The dish originated in 1876 when Ben Wenberg demonstrated the dish to a restaurant manager in New York. Wenberg was a sea captain. The meal was then refined by the chef, Charles Ranhofer, and subsequently added to the menu under the Lobster à la Wenberg moniker. From there, it really took off. It was very popular until there was a disagreement between Wenberg and the manager, Charles Delmonico. The dish was removed from the menu, though customers still requested it. Using an anagram -- or rearrangement of letters, it was recast as Lobster Newburg. Still popular, the name stuck with the dish and it has become a classic. The meal often is served in restaurants. When the recipe was first printed in 1894, it called for the lobsters to be fully boiled and then fried in clarified butter. Next, the meat was simmered in cream and reduced in half, and then brought to a boil again after Madeira wine was added. Lobster Newburg is similar to the dish Lobster Thermidor. That meal includes lobster meat that is cooked with eggs, sherry, and cognac. It emerged during a similar time.